We’d love your help. Let us know what’s wrong with this preview of Of Peaks and Prairies by Vivi Holt. She's married to a man she doesn't love, and didn't agree to marry. The scoundrel dragged her to the altar, and now everything is going to change. In a split second decision, she runs away, and stows aboard a chuck wagon that's leaving on a cattle drive, heading north to Montana Territory. She doesn't know where she's going, or what she'l Genevieve Waters-Ewing is married. She's married to a man she doesn't love, and didn't agree to marry. The scoundrel dragged her to the altar, and now everything is going to change. In a split second decision, she runs away, and stows aboard a chuck wagon that's leaving on a cattle drive, heading north to Montana Territory. She doesn't know where she's going, or what she'll do, she only knows one thing - she has to escape from Fort Worth, Texas. Thomas O'Reilly's finally got the chance to prove himself to his Pa. After finding gold in Montana Territory, he travels to Texas to buy a herd of longhorns to take back north with him, where demand for beef is high. Everything is going his way until he discovers a beautiful, young woman asleep in the back of his chuck wagon. A woman on the trail is bad for business, especially in a group of rough and rowdy cowboys. Will she ruin everything he's worked so hard for? Or will she be the one thing he really needs? To ask other readers questions about Of Peaks and Prairies, please sign up. Boring. That's the best word to describe this book. For a story that has a fair amount of stuff going on in it, it's hard for me to call it boring, but every issue is overcome quickly and with little problem. The author does a decent job at throwing conflicts into the story, but not a single one of them lasted for more than a couple chapters. Even the issue that kicks off the entire story is resolved easily and with little hassle to the main characters. It's just bizarre. On top of that, I have t Boring. That's the best word to describe this book. For a story that has a fair amount of stuff going on in it, it's hard for me to call it boring, but every issue is overcome quickly and with little problem. The author does a decent job at throwing conflicts into the story, but not a single one of them lasted for more than a couple chapters. Even the issue that kicks off the entire story is resolved easily and with little hassle to the main characters. It's just bizarre. On top of that, I have to say I'm not a huge fan of a hero that pursues a married woman. Yes, her husband is a creep and disgusting, but the fact is that she is married and claims to be so and tries to push the hero away, but he keeps coming after her. The fact is that he doesn't know any of the circumstances surrounding her marriage until at least halfway through the book, yet he's already made out with her. Just not a fan. I thoroughly enjoyed this audiobook! I haven't read a lot of Vivi's books but I plan to read more! I loved the surprising scenes with Sara and the Indians as well as the letter from Jenny's best friend! The Narrator did a great job and I got lost in the story as his cadence whipped me away to the trail! I'm sure to listen and or read more of Vivi's adventurous books! This is a well written romance with great characters, enough action and romance to keep you reading. I also enjoyed the multiple character stories instead of just focusing on the hero and heroine. Well done and I am looking forward to the next one. This is my favorite book from Vivi Holt thus far! Important reading note – while this is the first book in the Paradise Valley series, it continues the story of Bill and Sarah that is told in Holt’s book, The Strong One, which is part of the Cutter’s Creek series. You can read these books in either order, Of Peaks and Prairies certainly stands on its own, but I think it will be more enjoyable to read The Strong One first and read Bill and Sarah’s origin story first. The majority of the historical This is my favorite book from Vivi Holt thus far! The majority of the historical westerns that I have read fall into one of two categories: those that revolve around mail order brides coming from the east to marry men on ranches in the west OR life on an established ranch. Of Peaks and Prairies is different in that everyone who exists within these pages already lives in the west, but the majority of the story takes place along the trail while cattle are being herded from Texas to Montana. This was a refreshing change of pace as we encounter the variety of troubles that could come along with life on the trail that kept things exciting. Genevieve is desperate to get away from her home – it’s not really much of a home anyway and her step-father and new husband are just terrible men – and setting out on the trail seems like a better plan than staying home, regardless of what tribulations come with it. She doesn’t expect to fall for the handsome trail leader, especially since she is married, but that is what happens and provides quite a bit of trouble on the trek and between her and Thomas. Thomas is a good man on a tight schedule – he doesn’t really have the time to deal with the problems an unmarried woman (as far as he knows) on the trail will bring as he races the coming winter to get home. The romantic moments between the two are sparking, sweet, and at times infuriating (in a good way!). It’s a clean romance, but the tension between the two and the small moments are rewarding and fulfilling for the reader. I was super excited to return to the story of Sarah and Bill from The Strong One. I didn’t know that they would be part of this story before I started reading it and I quite literally cheered out loud when they returned to the scene. While mostly a sideline story, it still moves forward and they serve as a good foil/inspiration for Genny and Thomas. I also enjoyed seeing more of Sarah’s native lifestyle that we were briefly introduced to at the beginning of The Strong One. The book left me with a desire to read more books that will hopefully come in this series. I enjoyed all the characters and fell for Genny and Thomas – I can’t wait to see what will happen at Thomas’ new ranch (I enjoyed getting to know some of the cowboys and hope to see more of them). I also have a feeling that we are not done with the native side of Sarah’s story. Holt keeps the plot exciting while advancing the romantic threads of the various relationships at play here. The trail life blossomed from the pages and I felt like I was right there with them all and the hundreds of head of cattle. Well written, fast paced, and enjoyable all around. Of Peaks and Prairies is a story that will take you back to the pioneer days full of danger, hardship, strong men and women, as well as those who would prey upon others with relative ease. You’ll get a very strong sense of what it was like to be on a long cattle drive back in those times. The details make every aspect of life on the prairie, moving cattle from one state to another, and the dangerous aspects of every day life for those brave men and women. Genevieve’s life was hard, full of abuse and demands. But when her step-father actually handed her over to this despicable scum that he called friend to be forced into a marriage she did not want was the worst day of her life. No one with the power to stop them helped her, and her fate was sealed. But Genevieve is made of stronger stuff than to curl up in a corner and let the “marriage” become real. She takes an opportunity to escape by hiding in the back of a chuck wagon ready to head out on a cattle drive. They may make her leave when she’s discovered, but anything is better than what her so called husband has in store for her if he catches her. Tom is close to seeing the realization of his dream. He’s out on his own, no longer a part of his ranching family. He’s found his fortune and is forming it into a life that will sustain him for the rest of his years. Cattle ranching might be a hit or miss, but it’s what he has set his mind to. Now he just has to get these thousand or so long horns back to Paradise Valley in Montana. It’s going to be a long, tiresome and dangerous trip – and the last thing he needs is a female stowaway with a father and husband hot on her trail. I enjoyed my time with Genevieve and Tom as they fought, worked, and faced danger together. The honor that they both showed in facing the attraction between them yet denying it because of Genevieve’s situation shines through in it’s strength. There are many emotional moments, some extremely dangerous times, and a look back at what life was like before the modern day conveniences we so take for granted. It was a special treat to catch up with Bill and Sarah from Cutter’s Creek. While their story was complete, now they’ve joined this cattle drive and are on the move to a new life for themselves as well. Sarah will play several important roles in this story, so in my opinion, it will help if you’ve read The Strong One first. 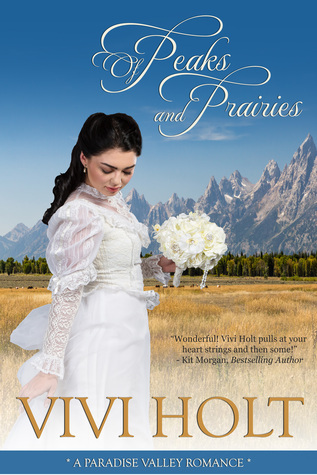 I would recommend Of Peaks and Prairies to any reader who enjoys a sweet and clean romance in the Western Historical genre. You’ll find interesting characters, danger, friendship, love, faith and hope among strangers who will form their own community over time. The book begins with Genevieve being forced into marriage by her evil stepfather. His best friend, Quincy, has coveted her for a long time. Now that Fred is ready to find himself a wife, he agrees to the marriage. However, Jenny definitely isn't ready for marriage, especially to the filthy and cruel Quincy. She becomes a stowaway in a wagon and soon finds herself on the way to Montana with a cattle drive. The handsome owner, Thomas O'Reilly, finds her and agrees to let her come along on the drive The book begins with Genevieve being forced into marriage by her evil stepfather. His best friend, Quincy, has coveted her for a long time. Now that Fred is ready to find himself a wife, he agrees to the marriage. However, Jenny definitely isn't ready for marriage, especially to the filthy and cruel Quincy. She becomes a stowaway in a wagon and soon finds herself on the way to Montana with a cattle drive. The handsome owner, Thomas O'Reilly, finds her and agrees to let her come along on the drive against his better judgment. Thomas is determined to prove himself to his father by driving a herd of Longhorns from Texas to the gold miners in Montana. When he tries to find out why Jenny is leaving Texas, she refuses to tell him the reason or that she is married. Of course, as in all of Ms. Holt's wonderful books, there is plenty of misunderstanding along the route to true love. How can Jenny love Tom when she is married (even though reluctantly)? Then, you have the side story of Sarah and Bill, which I hope to learn more about in subsequent books. Since my husband is an avid Western movie/TV fan, I have seen plenty of movies about cattle drives. Ms. Holt does a great job describing the hazards, the long days, and the hard work involved. The characters are wonderful and realistic, the story is uplifting, and of course, we have a HEA ending. Jenny is a typical heroine in that at times, I wished I could shake some sense into her for her reticence! 4.5 STARS is given to Vivi Holt for Peaks and Prarairies (Paradise Valley Book 1) for her wonderful descriptive book about a young woman whose mean stepfather forced her to marry his best friend and neighbor, a man that he got drunk with that was meaner than him older than he was and one of ugliest men Genny had ever seen in her life . Oh, Vivi has such wonderful descriptions I felt I could almost see what her ugly old husband looked like and smelled like, ugg! She did get married and the how made me both angry, sad, and reflect on just how many young girls & women were married in that way in fear. Her escape to Tom's Cattle Drive was interesting and him finding her was amusing as all get out plus showed some compassion. Then just great storyline about a cattle drive from Texas to Montana & everything in between. This book is worth your time. The only reason for knocking off .5 from a full 5 STARS is because Genny just kept not confiding in Tom until almost the end of story, and that just annoyed me. Genevieve has been forced to marry the friend of her stepfather, a bad tempered older man. Refusing to be subjected to a life with him, she runs away when her stepfather and husband leave her outside of the saloon to go imbibe. She follows a cowboy and stows away in a chuck wagon. Thomas is in Texas to collect a herd of longhorns and head back to Montana. Imagine his surprise when he discovers a beautiful stow away in his chuck wagon. Genevieve isn’t honest with Tom and tells him that she’s head Genevieve has been forced to marry the friend of her stepfather, a bad tempered older man. Refusing to be subjected to a life with him, she runs away when her stepfather and husband leave her outside of the saloon to go imbibe. She follows a cowboy and stows away in a chuck wagon. And I was happy to see our old friends, Sarah and Bill, from Cutter's Creek. Genny, feeling all alone in the world, couldn't have found a more understanding friend than Sarah in whom to confide on the way to Montana. I love the way the author conveys her female characters--vulnerable, yet strong, with courage and an ability to withstand hardship and to even find joy in the midst of it. In other words, they are like so many of the real-life women, like my grandmother, I am blessed to have known. I coudn't finish this book. I was about halfway through when I couldn't take it anymore. One thing follows another without a break or any character development. The insights to the characters minds are so cliché and kitschy that I couldn't take it anymore. This felt like a skeleton story that could've used a bit more story and depth. The writing style was not to my liking at all. For a sweet clean western, with adventure and trials and Indian raids, Soldiers, it's got it all. It's got you hoping for that happy ever after,while keeping you wondering it almost the end. Good job Miss Holt, can't wait to read the next one. I enjoyed this book. The cattle drive with long dusty days, indians, soldiers and Fred and Quincy all made for a difficult journey. I did not like Fred or Quincy at all. They were awful people. I hope that Cora gets to come visit Gabby sometime. It could've been this way? A sweet young lady,( Genny) runs away from home, for a good reason, and finds love, adventure and friendship on a cattle drive. Nice story. You really want her to find happiness. If you read one you're sure to want the following story in this series of a closely knit group of strong women matched by caring hard working men who love them. Enjoyable story with plenty of suspense. Characters are great. Your hooked from the start of this sweet romance. Can't wait for the next book in the series. Loved every page of this book! It is very exciting and very romantic! Can't wait to read the next book. I would say this is every woman’s nightmare being forced to marry a man you can’t stand who has nothing going for him. What a start to what looks to be an outstanding series. This is one story that the author weaves you a wonderful plot of being on the run with danger all around you as you travel across the plains with Indians who just might want a piece of your skin along with your husband and stepfather hot on your trail. This is one author that always gives you an exciting read as you set on I would say this is every woman’s nightmare being forced to marry a man you can’t stand who has nothing going for him. What a start to what looks to be an outstanding series. This is one story that the author weaves you a wonderful plot of being on the run with danger all around you as you travel across the plains with Indians who just might want a piece of your skin along with your husband and stepfather hot on your trail. This is one author that always gives you an exciting read as you set on the edge wondering what will take place next. This is a story that will keep you up late at night as you get so caught up on all the twists and turns. It was so nice to get an update on the past characters that you have come to love as well as new ones you will love. My heart went out to Genevieve losing her whole family and having to live with the evil stepfather who did not care for her. Her life was hard and rough which made her strong. She is such a sweet lady who gives so much of herself only to have herself be given away in marriage to a man even more evil then her stepfather. I cheered for her when she ran pushing her the whole way as my heart was in my mouth a time or two when things got a little hairy wondering what the outcome would be. Thomas is a man’s man with his honorable cowboy ways you are going to fall for him right away. From the first look he was taken in by Genevieve even when he knew he shouldn’t he still wanted her. He is a driven man trying to make his father proud. I wish I would know if he was but I am guessing that will come along as the series goes on. His life hasn’t been the easiest either not being the number one son always trying to do what was needed but just never good enough. His men come first and then his cattle. He overcomes every turn with class as he tries to get his cattle to their new home. I loved the pull and tug of war between these two. This is a story about learning to trust, giving ones heart as the author puts together a wonderful story that will keep you turning the pages. This was a thrilling exciting read I could not put down. I couldn’t wait to see what would happen next. It is really a wonderful heartwarming read that makes you wish you could be part of it. These characters become family as you watch them try to do the best they can. This is one author who pulls you in making you smile and almost cry. You are so going to love this author and her stories. Come pick up one of her books and be taken back to the west where not everything is as it seems with man who knew how to be men giving back to the land and their women. I enjoyed this emotional story that showed courage, determination, commitment, and faithfulness. Genevieve Waters-Ewing is a pawn used by her unscrupulous stepfather and unwillingly married to another. There is no love, only fear, and repulsion. Genny knows she has to get away, far away and she hides in the back of a chuck wagon, not even caring where it is going. Thomas O’Reilly has worked hard to prove himself, making an excellent fortune in gold, buying a thousand acre spread in Paradise Valley Montana, he has gone to Texas and taking back a large herd of longhorn cattle. Of Peaks and Prairies is book one in Paradise Valley series . Wow , what a first story for a series Vivi Holt has weaved. She plots and weaved a wonderful heartwarming story that will keep you on the edge of your seat reading way in the night turning pages to see what is going to happen next. Her story is clean, Inspirational, historical, and western romance. I really did enjoy the story and the characters, both was easy to follow. You will meet back up with Sarah and Bill , characters from The Strong One of Cutter’s Creek. Genevieve is another strong woman , I felt sorry for her and at times felt tears in my eyes, other times I was laughing. What is Genevieve to do ? Her mother is dead and her stepfather is dragging her to the alter to marry an older man, and one she does not love. Genevieve gets her chance after she is married , she runs away and hides in a chuck wagon that is part of a cattle drive headed North. She does not know where she is going as long as it is away from her stepfather, husband, and Texas. Thomas is headed North with his cattle he has come to Texas to buy. What will he do when he finds a beautiful woman in his chuck wagon? Will he send her back to Texas? A woman is a bad sign on a cattle drive. Genny’s stepfather was a mean man that married her off to his neighbor, an equally bully of a man. Genny couldn’t stay and be married to Quincy. She runs off and hides in the back of a cook’s wagon that is leaving on a cattle drive. However Quincy and Fred were not going to let her get away that easy, so they rode after her. Tom, owner of the cattle, discovers Genny and thinks to send her back however he would lose precious time on his drive. He was trying to beat the winter so he gives in to Ge Genny’s stepfather was a mean man that married her off to his neighbor, an equally bully of a man. Genny couldn’t stay and be married to Quincy. She runs off and hides in the back of a cook’s wagon that is leaving on a cattle drive. However Quincy and Fred were not going to let her get away that easy, so they rode after her. Tom, owner of the cattle, discovers Genny and thinks to send her back however he would lose precious time on his drive. He was trying to beat the winter so he gives in to Genny and lets her stay. Along the cattle drive, Tom finds himself attracted to Genny. This story has a unique plot that had some twist you don’t see coming. The characters were well developed and connectable. If you didn’t read the first book from Cutter’s Creek, you can still follow this book without any issues. I like how it weaved characters from Cutter’s Creek into this one. I felt already connected to the characters and was glad to see what happened to them. If you have read any of Vivi Holt’s books you will not be disappointed in this one. If you have not read any of her books, get started with this one. It is so good that you will be hooked and want to grab all the rest of her books. I highly recommend this book. This book was very well written and I enjoyed it very much. Genevieve's miserable step-father marries her off to his best friend, who's as crummy as he is. Sitting on a bench outside of the local saloon, right after the wedding-while the two men are inside celebrating the wedding- Genevieve follows a kind cowboy. She ends up in the back of a chuck wagon headed from TX to Montana. The trail boss/owner finds her, but doesn't send her back. Will Genny's step-father and new husband come looking for This book was very well written and I enjoyed it very much. Will Genny's step-father and new husband come looking for her?? Will she survive the long, hard trail?? Read this book and find out what happens to Genny. Genevieve is a strong, beautiful heroine in this gripping story about love, strength and determination. She hasn’t had the easiest of lives and one test after another comes her way. Vivi Holt’s writing kept me one the edge of my seat, wondering how Genny is going to escape the peril in her life. Thomas is a hard-working man who can’t walk away and leave Genevieve to her life. He has a back story of his own and he’s worked hard to get where he’s at. His background in gold and cattle has guaranteed Genevieve is a strong, beautiful heroine in this gripping story about love, strength and determination. She hasn’t had the easiest of lives and one test after another comes her way. Vivi Holt’s writing kept me one the edge of my seat, wondering how Genny is going to escape the peril in her life. Thomas is a hard-working man who can’t walk away and leave Genevieve to her life. He has a back story of his own and he’s worked hard to get where he’s at. His background in gold and cattle has guaranteed his success. Will the discovery of a woman on a cattle drive change the course of his future? Genevieve Waters has just become Genevieve Ewings, but not by her choice. Now that her mother has died, her stepfather has given her away to his old friend Quincy. Minutes after the wedding, Genny takes off and stows away in the chuck wagon of a cattle drive. There she meets the owner Tom and has an instant attraction. All she wants is to be free from Quincy and to follow her heart. Genny is soon to learn that life has many emotional ups and downs. Vivi Holt has started a Western romance series with tall cowboys, wild Indians, longhorn cattle, covered wagons, and wide open spaces. I really enjoyed this wonderful story! This book has wonderful characters and a wonderful plot! I had a hard time putting this wonderful book down!